It always bugs me when people in their desire to call someone a war criminal, to point out crimes against humanity, to pile on international statutes under which said person should be prosecuted, somehow fail to bring up the fact that said criminal is just another one in the long line of many who preceded him and probably will follow him in the future. I understand that this sad fact is not a justification for someone’s breaking laws and moral codes but at the same time what’s the point of plucking an evildoer from a lineup other than personal feeling of hatred. For the record I don’t care what happens to George W. Bush, but my feeling is that there will not be any kind of investigation or charge against him, since there are other ex-presidents still alive who are just as guilty, and many of the “public servants” who signed off on the criminal policies and actions are still happily serving in the government. I am often disputed when I point out that America used torture, deceit, murder, bribes, blackmail and other means to achieve it’s geopolitical goals, and many times I hear “we are better than that”. I would argue that there isn’t a country in the world which inflicted more lasting damage both economical and humanitarian in the past 50 years than the United States. Many modern states are still struggling to overcome what a few CIA officers and a few million dollars did to them in order to control their ideology or resources. These covert and overt actions happened under beloved presidents like Ike and JFK as well as under the hated ones like Nixon and G.W.Bush. I am not a historian but I can copy,paste and link with the best of them, so I will write a post or two about history that somehow touched my life and maybe point out a few facts that your selective memory may have left behind. I bet everyone who grew up in the USSR during the 1970’s knows about comrade Luis Corvalán – “the heroic leader” of the Chilean communist party (who lived in exile in Moscow) and Victor Jara – a brave patriot and a famous singer who was murdered by the bloody Pinochet’s Junta backed by the no-less-bloody military-industrial complex in the USA. I wrote before about the Soviet propaganda and how most people tuned it out, but in this case many years later I found out the the Soviets weren’t far from the truth – the United States financed and executed an operation to depose a democratically elected president Salvador Allende and created favorable conditions for the military coup. The ironic fact was that Chile was an established democracy since 1932 and the CIA had a lot of trouble influencing Chilean democratic politicians and military. After the coup the US kept members of junta on the payroll and continued to support the junta until the end. “There is no doubt”, the agency (CIA) confessed in a statement to Congress after the cold war ended, “that some CIA contacts were actively engaged in committing and covering up serious human rights abuses.” Chief among them was Colonel Manuel Contreras, the head of the Chilean intelligence service under Pinochet. He became a paid CIA agent and met with senior CIA officials in Virginia two years after the coup, at a time when the agency reported that he was personally responsible for thousands of cases of murder and torture in Chile. Contreras distinguished himself with the singular act of terror: the 1976 assassination of Orlando Letelier , who had been Allende’s ambassador to the United States, and an American aide Ronni Moffitt. They were killed by a car bomb fourteen blocks from the white house. Contreras then blackmailed the United States by threatening to tell the world about his relationship with the CIA, and blocked his extradition and trial for the murder*. Incidentally there was some talk about charging Kissinger with crimes against the people of Chile but it looks like he will probably peacefully die here and will be given a state funeral when his time comes. Once in a while my childhood memories about Chile come back: unbelievably, a sister-in-law of my childhood friend is now a top model and actress in Chile (I remember her when she was my daughter’s age); in a movie I recently watched “Blame it on Fidel” the parents of the main character become communists and active supporters of Allende in 1970’s France. My favorite quote from the movie is when the child who hears her parents talk about “group solidarity” and “sheep behavior” asks what’s the difference between the two. I still can’t answer that. The movie also reminded me of the song El pueblo unido jamás será vencido which I often heard when I was a kid, I think it was even translated in Russian. 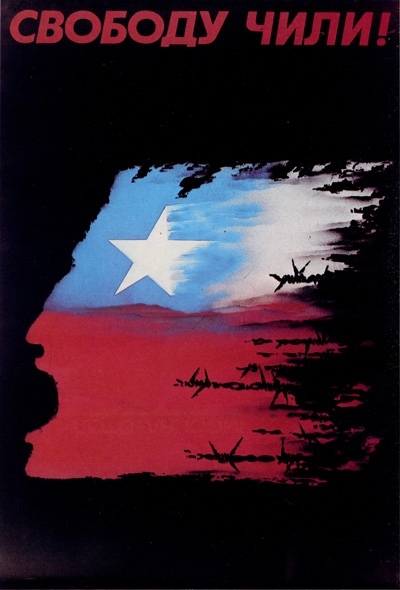 It became an anthem of resistance in Chile and around the world.